The Russian UR-100N / SS-19 Stiletto is a Soviet-made two-stage, liquid-propelled ICBM. Deployed beginning in 1975 to partially replace the SS-11 ICBM force,  the SS-19 is similar in design to the SS-11 Sego but with increased size and accuracy. The SS-19 is also similar to the Russian SS-18 Satan, as they use the same guidance and control systems, which permit remote monitoring and in-flight control of the missile. The ignition system of the SS-19 is hot launched, meaning ignition of the main engine occurs while the missile is still in the silo. During the Cold War, the SS-19 Stiletto was a primary component of the Soviet Unions nuclear forces. Originally being deployed in 1975, it represented another threat to the United States and to its allies. By the mid 1980’s, over 300 SS-19 Stilettos were deployed and ready to be launched. In 1993, the START II treaty between the US and Russia required the number of SS-19 Stilettos to be reduced to 100 however following the US withdrawal from the ABM Treaty, Russia withdrew from START II leaving the number of SS-19 Stilettos still at Cold War levels. However, a small number of Stilettos had been dismantled by Ukraine following the collapse of the Soviet Union. In 2008, Russia tested the SS-19 to test the weapons reliability and determine if the weapon could remain a member of Russia’s nuclear arsenal. The SS-19 performed capably and it was determined that the missile could remain operational at least until the year 2031. “UR-100N / SS-19 STILLETO.” Federation of American Scientists. 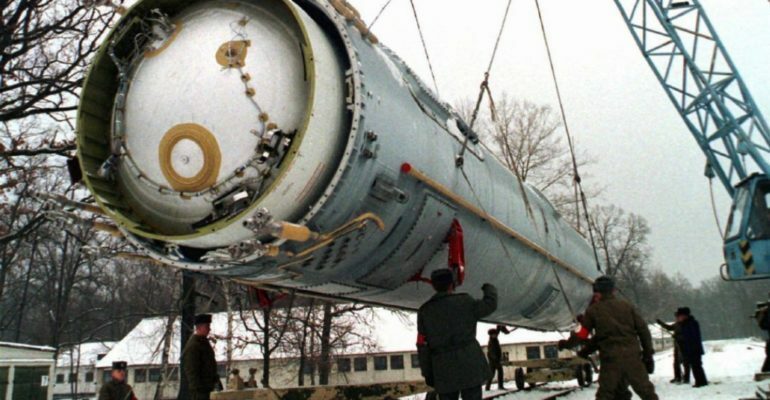 Last updated July 29, 2000. http://fas.org/nuke/guide/russia/icbm/ur-100n.htm. “RS-18 MOD 1/-MOD 2 (SS-19).” Missile Threat. Last updated December 5, 2012. http://missilethreat.com/missiles/rs-18-mod-1-mod-2-ss-19/.